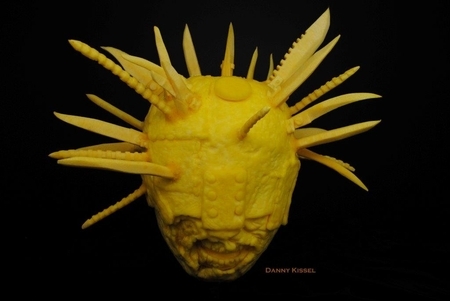 Every year, without fail, Danny sends us some of the coolest pumpkin carvings we've seen. This year, he sent us this scary looking dude with a bunch of knives and nails sticking out of his head. Apparently it's a character from the TV show The Walking Dead. If I had that many knives sticking out of my face, I don't think I would be doing much walking, but I would definitely be dead.